Size: 5.6" x 3.0" x 0.4"
This Canon F-502 is a pocket-sized statistical calculator that handles up to 136 functions, and its large, high-contrast liquid crystal display makes calculations easy and comfortable. 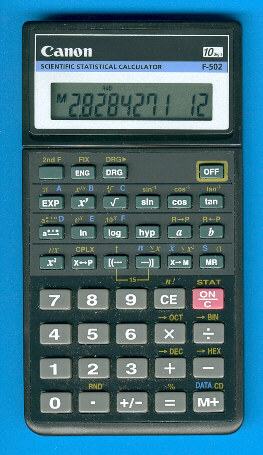 The calculator includes trigonometric standard deviation, hexadecimal conventions, number base conversions and calculation memory. © Joerg Woerner, September 23, 2003. No reprints without written permission.